The following quotes were taken from Connecting for Kids families last fall, as the winter holiday season approached. Do you have something to add? Email us at webmaster@connectingforkids.org. Teach family members that high fives and fist bumps mean just as much (or more) in your family because your child can give and accept these shows of affection without being forced into a situation that causes extreme anxiety. Please understand if we leave early, It’s best for everyone that we leave when we say it’s time. We know when the kids have had enough and when the environment is making them uncomfortable. If we choose not to participate, please know that it isn’t that we don’t want to but that the event/activity is likely “too much” right now. If my child is rude, like saying the food is horrible, not thanking you for a gift, or corners you and talks on and on without taking a breath, please know that we are working on it. If I give my child a correction in manners, please don’t undermine me by saying it isn’t a problem. The correction isn’t for your benefit, but his. Please follow my lead with strange behavior. If I ignore it, you should too. Be respectful of my child’s needs when you visit my home and the fact that I am doing the best I can for him or her. Adding your parenting advice or overstepping boundaries can cause tremendous anxiety and/or undermine lots of hard work. For more information on what your family can do to help make the winter holidays better for a child struggling with anxiety, behavior challenges or a social skills delay, see Winter Holidays: Anxiety, Behavior and Socials Skills. Understand that food choices and meal times can be tough for us and that we’re doing our best. If I give her a bag of potato chips instead of the fancy dinner you’ve prepared, it’s not because we don’t appreciate the work you’ve done. Her sensory inputs are off the radar right now and she needs something familiar. Welcome the struggling child to the family table, but be prepared to offer an alternative, quieter place to eat, just in case. For more information on what your family can do to help make the winter holidays better for a child struggling with food allergies or feeding challenges, see Winter Holidays: Food Allergies and Feeding Challenges. Be understanding when it comes to sensory issues. If my child puts his hands to his ears, it means that something is making him uncomfortable. Try to provide a room or area that the child and parent can sit in that is quiet and secluded. This allows the child to stim (if needed) or can help parents prevent a meltdown without interrupting festivities for others or feeling like they are on display. While everyone looks beautiful dressed up, my children have a hard time with tags, seams and material. Please try to be understanding. 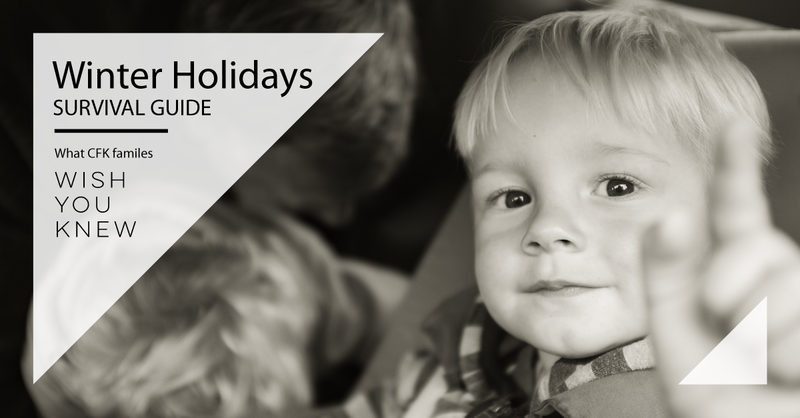 For more information on what your family can do to help make the winter holidays better for a child struggling with sensory challenges, see Winter Holidays: Sensory Challenges. Please consider sitting with our child for a few minutes during an activity so that we can use the bathroom alone, mingle with others for a few minutes, or eat something while the food is still hot. We can never say thanks enough for this small gesture. For more information on what your family can do to help make the winter holidays better for a family with a struggling child, see Winter Holidays: Acts of Kindness that Make a Difference.